Brussels Sprouts and Egg Toast is one of the best combinations of fall. Egg is something I really can’t live without and I can pair it with anything. 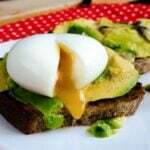 Unlike many people, egg is not only a breakfast food for me. I can have it at lunch and dinner as well. I can even have it as a snack between meals if there are any leftover hard boiled eggs. In short, eggs make anything even more special and tastier. This Brussels Sprouts and Egg Toast is no exception! If you love eggs as much as I do, I recomend you to check my Cheese Tart with Egg, Egg and Avocado Toast, Egg Stuffed Tomatoes and even more egg recipes on Give Recipe. Let me share a secret with you. I break eggs on any vegetable you can imagine and make the vegetable hater in the family, that’s Yusuf, eat it that way. Ok maybe he is not a hater but he is not a fan of vegetables, either. He just doesn’t complain eating zucchini, leek and spinach when there is egg on the top as in my Spinach with Egg recipe. Let’s admit this: Brussels sprouts aren’t everyone’s favorite vegetable. I really don’t understand why, aren’t they so cute? 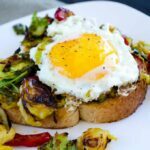 I can hear you saying “In appearance yes they are, but when it comes to taste, no no!” I promise you will change your mind once you try this Brussels Sprouts and Egg Toast. The best thing about the Brussels Sprouts and Egg Toast is that you don’t need to spend much time in the kitchen. Everything goes into a skillet and cooked in about 20 minutes. Saute roughly chopped brussels sprouts, onions and red bell pepper in a skillet and when they are done, make room for two eggs in the skillet and break the eggs right in there. Cook it until the eggs are done and serve on toasted bread. Could it be any easier? Sauteed Brussels sprouts, onions and red bell pepper with eggs. Serve it on toasted bread. Heat olive oil in a non-stick skillet and saute onions in it over medium high heat until golden. Toss in red bell pepper and stir. Cook for 2-3 minutes, stirring occasionally. Add in brussels sprouts and cook until they are slightly brown. Season with salt and black pepper. Make rooms in the skillet for two eggs and break the eggs right in there. Cook until the whites are set. 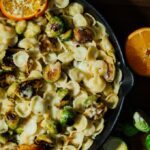 I’m so going to make this for breakfast the next time I have leftover Brussels sprouts!